In today’s world of social and digital everything, we are constantly connected. This connection enhances several areas of our lives, and a recently launched program by AT&T, takes a look at the next frontier of faith-based experiences in a mobile world. AT&T Inspired Mobility is a national program, sparking an online conversation around how people use mobile technology, mobile devices, and the Internet to enhance their faith experience and stay connected with their personal inspiration sources. 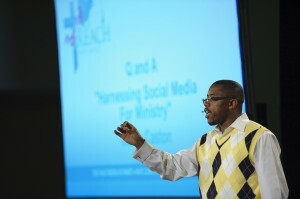 As we see the rise of these conversations beyond physical walls, with faith-driven marketing from Hollywood movie studios to the churches themselves becoming publishing empires, it bears noting how within the African American (AA) segment from a communications marketing standpoint, the faith community is widely considered to be the original social network. Many, not all, African Americans are deeply connected to their faith community, which serves as the bedrock of spiritual activity, and is a place where key stakeholders who want to have high reach and credible relationships with this community, turn to share messages. Brands with programs such as AT&T’s Inspired Mobility have achieved great success in connecting with the black community, in a relevant way, where they are already actively engaged. According to a recent AT&T survey in collaboration with EBONY magazine, the research points to an overwhelming acceptance with more than 90% of survey respondents indicating technology has a place in the church. Additionally, nearly 80% of respondents indicated that technology has had a positive impact on their worship experience, with the largest percentage of respondent’s using mobile devices to read scripture (22%) or take notes (15%). The AA segment consists of key consumers, overall seen as the trendsetters, influencing what makes its way to the general market. This acceptance, implementation and growth of faith-based marketing and mobile experiences is poised to continue with experts such as Jason Caston, creator of The iChurch Method, leading the discussion. Check out this video to see Inspired Mobility in action. To join this conversation, weigh in on social media using #InspiredMobility, or let us know what you think below. Christina Steed is the Executive Vice President at FCG.